The Emperor appears as trump card #3 in the type B ordering we are following in this essay. A number of examples of the Emperor card have survived from the 15/16th centuries (Fig. 1) although it is clear that some of the images are copies or adaptations of others. All of the Emperors are on thrones with scepter and orb, though in one case the orb is on the top of the scepter instead of being held in the hand. Six of the 9 cards show the black eagle, the heraldry emblem of the Holy Roman Emperor. The emperor was a familiar figure in 15th century Italy. For example, the Imperator appears as one of the 'estates of man' in the so-called tarocchi of Mantegna at www.levity.com/alchemy/mantegna.html. So it seems obvious that, first and foremost, the Tarot image would have been recognized as the Holy Roman Emperor. Some of the Tarot images (Fig. 1) show a crown that looks like the one used by Henric of Luxembourg in the 14th century. This crown is shown at www.levity.com/alchemy/andreae_crest.html. None of the Tarot Emperors wears a crown that resembles the earlier, traditional crown of the Holy Roman Emperor which can be seen at www.uno.edu/~inst/tmc/images/crown.jpg. Thus, it would be difficult to argue that the Emperor cards in Figure 1 were produced earlier than the coronation of Henric in the 14th century. Hind (1835, p. 87) shows a woodcut of the Emperor on horseback. This image is interesting because the woodcut is a German playing card ~1470. The image of the Emperor can also be seen in the astrological woodcut (Fig. 2, 1515) by Schoen that was mentioned in the chapter on the Bagatto. As in the early Tarot cards, the Emperor appears seated, with a domed crown, scepter and orb. Like many of the trump cards, the Emperor might be thought of as an archetypic image. In this case, the image would be related to the 'father' archetype: protecting, stern, wise, and just. Like other archetypic images, the Emperor was used as a symbol or personification of a mythic god. However, no one seemed to agree on which god! In the 14th century, he appears as Saturn (Fig. 3). In ~1420 he appears as Apollo (Fig. 4) with the aura of the Sun behind his head. And he also appears in the 15th century as Jupiter (Fig. 5) complete with black eagles. 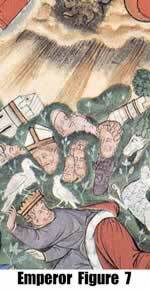 Although the Emperor was a symbol of temporal rule, similar images were used in a religious context as well. For example, Emperor and Pope appear together in a 14th century image (Ragg 1907, p. 48). Images similar to the Emperor were used to depict David as the great ruler of the spiritual kingdom of Israel (Figure 6). This image of David from ~1402 shows many similarities to the Tarot Emperor with crown and scepter, canopied throne, bearded, and with his feet crossed. Voelkle and L'Engle (1998, p. 141) show a similar image of David enthroned with crossed legs. The Emperor occurs as an incidental image in the artistic tradition based on Petrarch. The only reference in the poem itself is the same as that we quoted for the Empress: "First of us all, is Caesar, whom in Egypt Cleopatra bound, amid the flowers and grass". This doesn't really fit the imagery of the early cards. Representations of the Emperor in the artistic tradition deviate quite a bit from the description in Petrarch's poem. Crowned figures, that don't resemble Caesar, appear following along behind the chariot in the Triumph of Love. The Emperor also appears in representations of the Triumph of Death. Typically, the chariot of Death is shown rolling over a number of figures, including the Emperor. 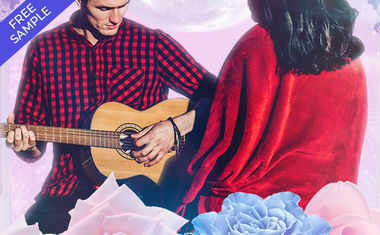 Characteristic imagery will be shown in the chapters on the Lovers and Death cards. The Emperor also appears as one of the "estates of man" in the dance of death tradition. In a woodcut illustration of 1485 (see Death chapter, figure 5) the Emperor is being led away, holding an orb and the double-headed eagle of the Holy Roman Emperor. 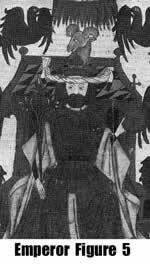 Williams (1994, p. 89) shows the enthroned Emperor with sword and orb being crowned by Death (~1518). The symbolic meaning of the Emperor in the Triumphal and Dance of Death traditions is primarily the fallibility of man. If the Emperor, the highest temporal state of man, is subject to love and death, then so must we all be. In the Apocalyptic tradition, the Emperor plays a more important role and his fallibility is taken an additional step since now he also appears as a sinner. Figure 7 shows the sinful ruler being subjected to the wrath of God. The image in Figure 7 is particularly interesting because it shows the ruler in the same image with Moon, Sun, Devil, and falling Towers. 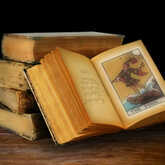 As we will see in numerous other illustrations, the symbols of the Tarot appear in association with each other. Saxl (1957, fig. 150) shows a Durer woodcut in which the avenging angels are slaying both Emperor and Pope. The antithesis of the punished Emperor is also represented in the Apocalyptic Tradition. For we also see God as the Emperor, ultimate ruler of all things (Figure 8, 1495), wearing the domed crown characteristic of the Emperor. 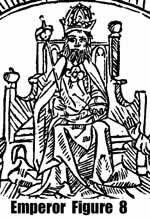 Similar images (Anonymous 1999, p. 67) show God as the enthroned Emperor (~1373) with the river flowing from the throne (Apocalypse 22:1). Looking across the various ways in which the Emperor image was used in the 14/15th centuries we find a dichotomy. On the one side, the Emperor is the highest temporal state that a man can achieve. The Emperor was seen as the symbol of power, and perhaps even as divinely appointed, prefigured by David. Certainly a paternal figure to be admired. The Emperor, like any other human, could aspire to the archetypic model of God as divine ruler. On the other side of the coin we find that even the greatest of men are fallible and responsible for their sins. The greater the status, the greater the potential fall. Thus, temporal achievement, wealth and power are seen to be secondary to spiritual development. There is also an esoteric tradition that saw the ruler as a magical figure. His health and masculine vitality maintained the fertility of the land and the power of the kingdom (Willeford 1969). Seznec (1953, Fig. 3) shows a 10th century image of Apollo Medicus, the enthroned Emperor as the wise medical doctor maintaining the health of the empire in his own vitality. In the traditions of the late medieval world, the magic of the Emperor can be contrasted with the magic of the Fool. The Fool, the lowest estate of man, is magical because he is outside the domain of conventional society. The Emperor, the highest temporal estate, operates within conventional reality and by rising above convention, becomes its magical foundation. This magical status is represented in a 15th century alchemical text, the Codex Palatinus Latinus 412, as the double headed eagle of the Holy Roman Emperor being hatched from the philosophical egg wearing the papal and temporal crowns. The 15th century card-player would most likely have seen the Emperor as the supreme temporal estate of man. This would have elicited a sense of admiration, perhaps tinged with jealousy. But in an age of belief, rebellion against a divinely appointed ruler was not an option so the jealousy would not have been overbearing. The Holy Roman Emperor would likely have been seen as a paternal archetype. The ruler-father was protective, stern but just. The Emperor was a magical father, maintaining the good order and the fertility of the empire. As divinely appointed, the Emperor symbolized God's order in the laic sphere: justice and order. Thus, the Emperor was a spiritual symbol as well as a temporal figure. The card-player would also have been familiar with the moral aspects of the Emperor symbol. Even the highest estate of man was subject to human fallibility. Even the Emperor was subject to death. Even the Emperor would be punished for immorality. And if the Emperor cannot escape death and punishment, then surely the card-player would be subject to the same human fallibility and the same death and judgment. Like the rest of western Christianity, the 15th century card-player was convinced of the imminent end of time. The prophesies of Joachim of Fiore had been widely preached by the mendicant friars. These final times would begin with the appearance of a great temporal leader, a final Holy Roman Emperor. So it is likely that the appearance of the Emperor card would have occasionally prompted apocalyptic thoughts in the card-player.